LAWYERS swapped wigs and gowns for shorts and running shoes to raise funds for a disaster-hit region of Bangladesh. 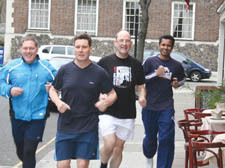 Ex-Camden councillor Robert Latham, who works at the Doughty Street Chambers, enlisted the help of fellow legal eagles to run a half-marathon in Bath – and at the same time raised cash for the Cyclone Sidr fund, organised by Camden Labour councillor Nash Ali. Mr Latham, 54, whose legal work includes defending the rights of people living in social housing, was joined by Keir Starmer, the civil rights specialist who won QC of the year in 2007. For Mr Latham, the distance held few fears. But it is the trials and tribulations of legal issues that has provided inspiration for extended training sessions. The group are still raising funds from their efforts – and anyone who chips in will have their name placed in a prize draw to win a meal in the silks’ favourite lunchtime eaterie – the Salaam Namaste in Millman Street.